Hearing is a complicated process. In a normal ear, sound vibrations are funneled by the outer ear into the ear canal where they hit the tympanic membrane (ear drum). These waves cause movement of the ear drum, which transfers the vibrations to the three small bones of the middle ear, the malleus (hammer), incus (anvil), and stapes (stirrup). 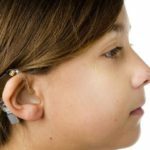 When the stapes bone moves, it sets the inner ear fluids in motion, which, in turn, start the process to stimulate the tiny sensory hair cells in the inner ear, which connect with the auditory (hearing) nerve. The hearing nerve then carries sound information to the brain, resulting in the hearing of sound. When any part of this process is compromised, hearing is impaired. The hallmark symptom of otosclerosis, slowly progressing hearing loss, can begin anytime between the ages of 15 and 45, but it usually starts in the early 20s. The disease can develop in both women and men, but is particularly troublesome for pregnant women who, for unknown reasons, can experience a rapid decrease in hearing ability. Because many of the symptoms typical of otosclerosis can be caused by other medical conditions, it is important to be examined by an otolaryngologist (ear, nose and throat doctor) to eliminate these other reasons. After an examination, the otolaryngologist may order a hearing test. The typical finding on the hearing test is a conductive hearing loss in the low-frequency tones. This means that the loss of hearing is due to an inability of the sound vibrations to get transferred into the inner ear. Based on the results of this test and the exam findings, the diagnosis of otosclerosis can be made. The otolaryngologist will suggest treatment options. If the hearing loss is mild, the otolaryngologist may suggest continued observation or a hearing aid to amplify the sound reaching the eardrum. Sodium fluoride has been found to slow the progression of the disease and is sometimes prescribed. In some cases of otosclerosis, a surgical procedure called stapedectomy can restore or improve hearing. Otosclerosis affects both ears in eight out of ten patients. For these patients, ears are operated on one at a time; the worst hearing ear first. The surgeon usually waits for a minimum of six months before performing surgery on the second ear. Most patients return home the evening after surgery and are told to lie quietly on the unoperated ear. Oral antibiotics may be prescribed by the otolaryngologist. Some patients experience dizziness the first few days after surgery. Taste sensation may also be altered for several weeks or months following surgery, but usually, returns to normal.